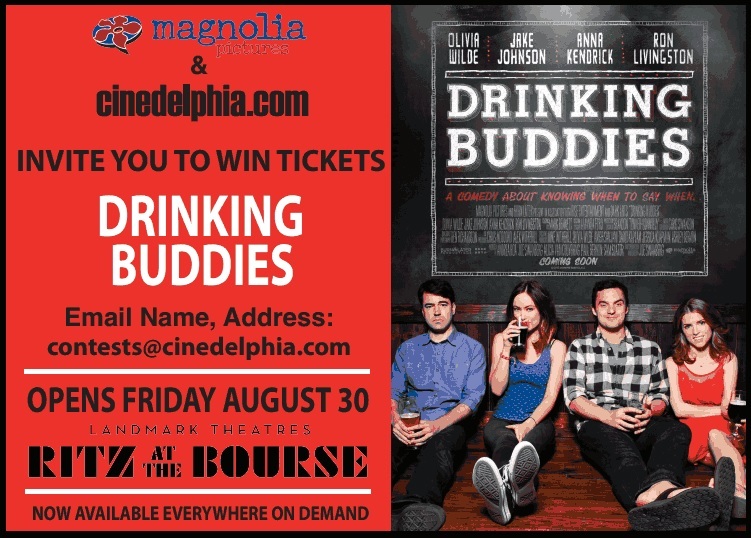 We’re giving away a bunch of pairs of movie tickets to see Drinking Buddies at the Ritz at the Bourse. To enter, e-mail us at contests@cinedelphia.com with your mailing address. Winners will be chosen at random, only one entry per household please. Kate (Olivia Wilde) and Luke (Jake Johnson) are co-workers at a Chicago brewery, where they spend their days drinking and flirting. They’re both in relationships with other people, Luke is with his schoolteacher girlfriend Jill (Anna Kendrick), while Kate keeps it casual with her older, music producer boyfriend Chris (Ron Livingston). An attempt to become “couple friends” further complicates the situation; a few weeks later, Kate and Luke suddenly find themselves alone together for a weekend. Suddenly the line between “friends” and “more than friends” begins to blur in unexpected ways.